As the post-civil war slogan famously said, “Abe Lincoln may have freed all men, but Sam Colt made them equal”. Firearms themselves, however, are not all created equal. This is especially true when you put them under the pressures and strains that a post-disaster weapon would have to live up to. When the SHTF, you want a gun that you can count on. Whether you’re hunting for food or fighting for your life, you need an accurate, reliable weapon that goes bang each and every time you pull the trigger. Listed below are nine guns you can bet your life on. One of the best-selling shotguns of all time, the Mossberg 500 has been used by the US military since the 1960s. It’s super reliable, easy to disassemble and work on, and just at home in the woods as it is the middle of a firefight. Best of all, a wide range of shotgun ammunition gives you a lot of versatility, allowing you to hunt cottontail rabbits and breach doorways with the same weapon. Few rifles can compare to the accuracy and reliability of this classic. The Remington 700 is still used by military and SWAT snipers to this day, and this rifle fits perfectly in the narrow class of rifles that are light enough to take hunting yet accurate enough to use as a sniper rifle. If you are wanting a mobile weapon that can still send lead a long ways down range, the Remington 700 is the perfect choice. Glock has made an incredible name for themselves producing near indestructible pistols that function flawlessly. This particular pistol is a compact model that is chambered in 9mm. Though most any Glock is arguably as good as the other (Glock just about always delivers with every weapon they make), the Glock 19 made the list because it is small enough to be concealed, large enough to be accurate, and is chambered in what is arguably the most popular pistol round of all time. Few weapons platforms are more popular than the AR-15, and a large number of brands make their own version of this weapon. You’ve got a lot of choices when choosing which AR-15 to buy, but the version that Colt makes is as good as any of them. The Colt AR-15 is one best weapons you could hope to have in your hands if you ever find yourself in the middle of a full-blown firefight. It’s reliable, can hold 30 or more rounds depending on the clip you have in it, shoots as fast as you can pull the trigger, and is extremely easy to customize in a wide variety of ways. All said, owning a Colt AR-15 is as close as you can get to being a one-man army. The M1A is the civilian version of the popular M14, though really there isn’t a lot of difference between the two models. This ultra-reliable rifle functions both as a long-range weapon and a fast-firing semi-automatic weapon for sending out lots of lead in mid to close quarter combat. It doesn’t have the capacity of the AR-15, but it does have better accuracy for long range shots and a 308 round that packs a punch. If you want a pistol with the knockdown power of a howitzer, the S&W 500 is the choice for you. This beast of a handgun is chambered in the massive .500 S&W cartridge, and it packs a wallop. 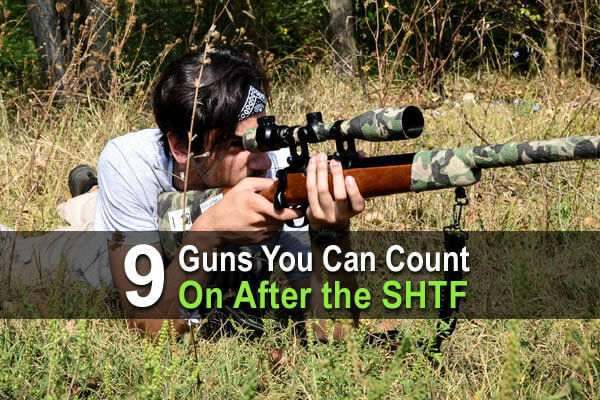 Why, though, is the S&W 500 a gun that you can count on if the SHTF? For one, it brings the accuracy of some rifles into the size of a pistol (though, admittedly, a rather large pistol). It’s also a revolver, which means it’s as reliable and durable as a gun can get. Lastly, the S&W 500 is essentially the pistol version of a 50 cal. It’s a weapon you carry on your hip that’s still powerful enough to shoot through small obstructions and light cover. You’d be hard pressed to find another concealable weapon that has that much power. Ruger describes the 10/22 as “America’s favorite .22 rifle”, and that’s a statement that would be hard to argue with. The 10/22 is a classic, and for good reason. It’s reliable, accurate, and as customizable as a .22 rifle can be. While you won’t be taking a .22 into any shootouts if you have the choice, a .22 rifle is still a gun that is priceless in a disaster situation. The ammunition is cheap and light enough to carry thousands of rounds all day without breaking a sweat. The gun itself is quiet enough to avoid detection and is perfect for taking down small game. Few weapons have put more meat on the table than the .22, and the Ruger 10/22 is among the best .22 rifles available today. If you want a truly elite home defense weapon, the Kel-Tec KSG is the firearm of choice. This shotgun is as compact as is legally allowed in the United States, yet despite its size, it still holds an unbelievable total of 12 3-inch 12 gauge rounds. Its dual magazines allow you switch between various projectiles with ease, which could come in handy in a variety of ways (such as giving you the ability to switch between lethal and nonlethal rounds) and the KSG’s largely composite construction is as reliable as it gets. Put a Kel-Tec KSG in the corner by your bedside and rest easy at night. The AK-47 is a fighting machine, and even the semi-auto variations of it (which can be legally purchased without any kind of special licensing) are one of the most effective weapons you could have in a mid-range fight. The Kalashnikov is just one brand that produces semi-auto AKs, and there several other good ones available. Whichever brand you go with, know that you are getting a reliable weapon that has stood the test of time.